A recent addition to our collection shows that Brookes and Adams were associated with the plastics industry, even earlier than we first thought. It is a Union Case made of moulded shellac in around 1860. Union cases were made to protect Daguerratype photographs from damage by ultra-violet light. 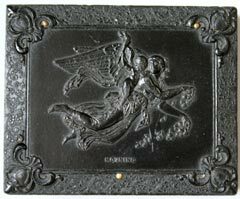 "Central to the manufacture of any moulded plastic products was the employment of high quality die engravers, and Smith was fortunate in being able to contract within a short walk of his premises, the services of two fine engravers, Brookes and Adams, of Great Charles Street." So now we know. They were the same Brookes and Adams who founded the firm that later went on to produce "Bandalasta". Another piece of the puzzle solved. The story continues in 1923, 13 years after Dr. LEO BAEKELAND patented a technique for combining Phenol and Formaldehyde. 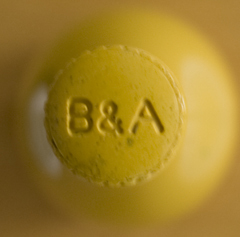 When combined with large amounts of wood flour or other "fillers" this Phenol Formaldehyde could be used for moulding consumer goods, usually in black or dark brown, and was known by the now familiar term BAKELITE. 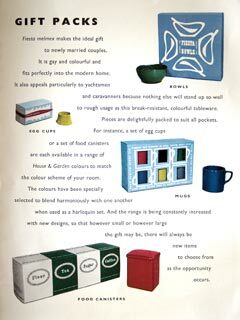 Brookes and Adams were one of the first, if not the first, to use these Phenolic resins to produce and market tableware and other household items in the U.K. This tableware was known as "Banda Ware". It would appear, however, that there must have been a short transition period after the development of thiourea formaldehyde and before the term BANDALASTA was introduced. There are some early marbled Beatl products bearing the name "Banda Ware" . (See items 55, 57 and 62 in the catalogue section of this website). 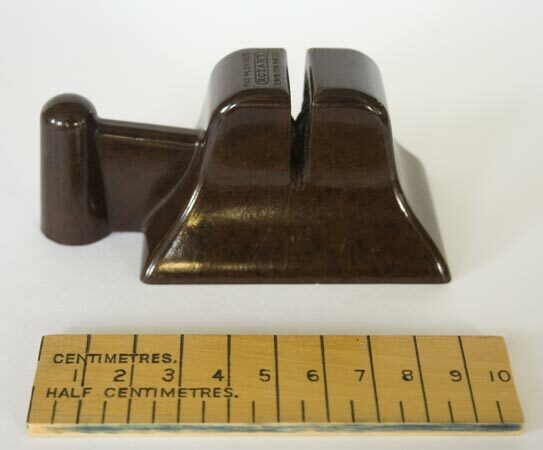 The "Rotary" Knife Sharpener, illustrated below left, was patented to Karl Mellor Gibbons in 1925 (patent no. 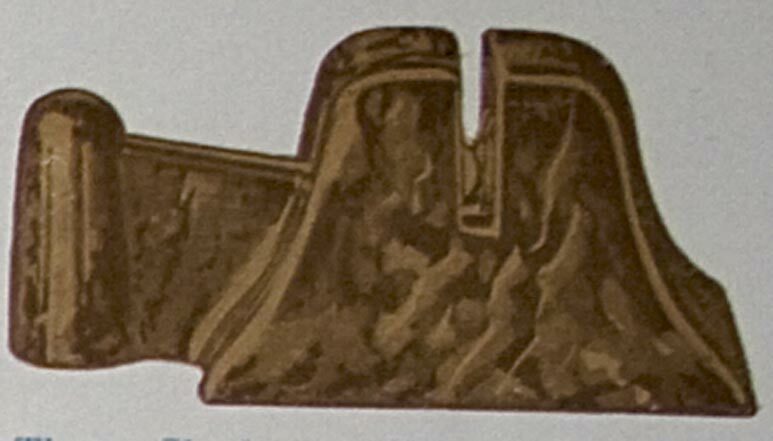 233855), but is definitely moulded by Brookes & Adams as part of their "Banda" Household Utilities range as illustrated in one of their price lists from 1933 (Below right). It was sold in three colours: - Walnut (see below), Mottled Green and Mottled Red. 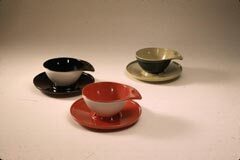 Brookes and Adams have been manufacturing Bowls, in a variety of sizes, for many years. They are probably best known for their Carpet Bowls but did once produce Garden Bowls which were larger than the carpet bowls but smaller then full size ones. 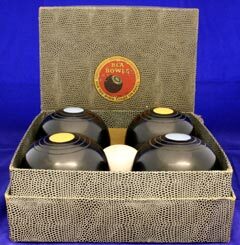 The packaging of the Bowls has changed over the years, some of the earlier ones being packaged in wooden boxes. The cardboard boxes have also changed, the earlier ones being in brown and subsequently in grey and green. 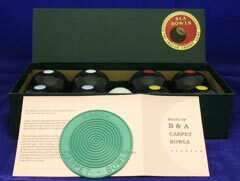 Carpet Bowls are still being manufactured in two sizes, 2 inch and 2.5 inch (see the Brookes & Adams website ). 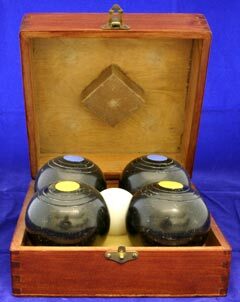 Each set consists of four pairs of handed polished compression moulded bowls, jack, mat and rules. 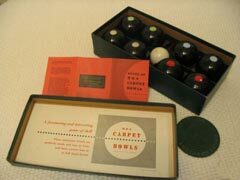 Recently, Brookes and Adams moulded sets of carpet bowls for Marks and Spencer. Minor Bowls - 4 inch Diameter - "For the lawn large or small". Mini Bowls - 3 inch diameter - In wooden box. Carpet Bowls - 2.5 inch diameter - Still being made. Carpet Bowls - 2 inch diameter - "Made in England for Abercrombie and Fitch". 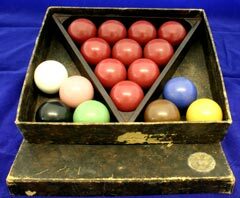 As well as draughts, dominoes and skittles (illustrated in the Catalogue pages), Brookes and Adams also produced compression moulded Snooker and Billiard Balls. There is also a patent for a golf game. The snooker balls illustrated to the left, are only 1.375 inches in diameter although B&A did produce full size ones. We read somewhere (although we've forgotten where!) that production of Snooker balls ceased just before the BBC launched it's successful "Pot Black" snooker programme in 1969. Had they continued production they may well have capitalised on the sudden upturn in the fortunes of the game. Available in sizes 1" 1/8", 1" 1/4", 1" 3/8", 1" 1/2", 1" 5/8", 1" 3/4", 1" 7/8", 2" and 2" 1/16", to match Snooker Sets. 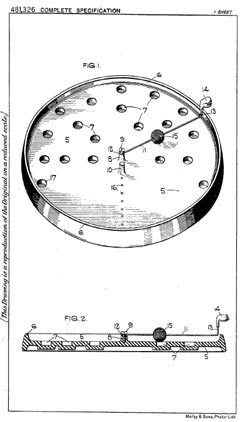 "This invention relates to apparatus for playing an indoor game resembling golf"
This game later went into production under the name "Whizzy Golf". 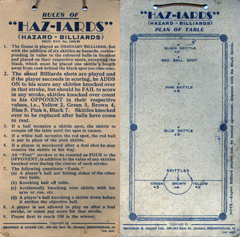 A recent discovery, on eBay, was the game "HAZ-IARDS" (Hazard Billiards), played on a Billiards table with the skittles placed in approximately the same positions as the coloured balls in Snooker. A full set of instructions is given below. The Game is played as ORDINARY BILLIARDS, but with the addition of six skittles as hazards, corresponding in value to the coloured balls in Snooker and placed on their respective spots, excepting the black, which must be placed one skittle's length away from cush behind the black spot (see other side). The usual Billiards shots are played and if the player succeeds in scoring, he ADDS ON to his score any skittles knocked over in that stroke, but should he FAIL to score in any stroke, skittles knocked over count to his OPPONENT in their respective values, i.e., Yellow 2, Green 3, Brown 4, Blue 5, Pink 6, Black 7. Skittles knocked over to be replaced after balls have come to rest. If a ball occupies a skittle spot, the skittle to remain off the table until the spot is vacant. If a white ball occupies the red spot, the red ball is put in place of the pink skittle. If a player is snookered after a foul shot he may remove the skittle in his way. All "Foul" strokes to be counted as FOUR to the OPPONENT, in addition to the value of any skittles knocked over during the course of such stroke. (a) A player's ball not hitting either of the other two balls. (b) Knocking ball off table. (c) Accidentally knocking over skittle with his arm or cue, etc. (d) A player's ball knocking a skittle down before it strikes the objective ball. A player is not allowed to play on after a foul stroke, or count any score for that stroke. Player first to reach 100 is the winner. 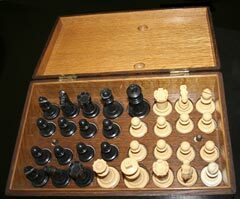 According to Adrian and Frank Brookes this is probably a one-off chess set made by Arnold E. Brookes. Note the depressions in the lid to take the King's crowns! 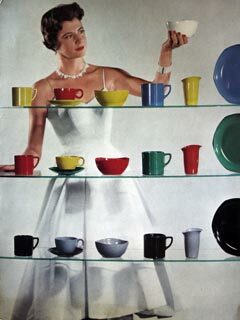 Just as the 1930s had seen a change from "Beatl" - Thiourea Formaldehyde to Urea Formaldehyde, the 1950s saw yet another change to Melamine Formaldehyde (Melamine). 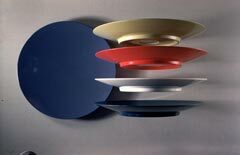 During this period there was a degree of overlap, and some of the "new" Bandalasta items were moulded using Melamine, specifically a brand from British Industrial Plastics known as "Melmex". Some of the old designs continued to be made using this new material. In the late 50s early 60's, Brookes and Adams introduced a new range, using Melmex, called "Fiesta" designed by Ronald E. Brookes. 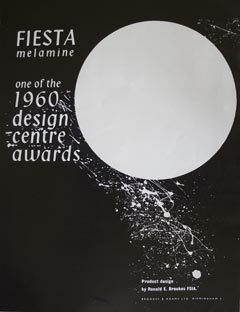 This new range was one of the winners of the 1960 design centre awards. Gradually Melamine replaced Urea Formaldehyde. Left, Advert from "Design, No. 138, June 1960". Below, two pages from a sales brochure from the early 1960s. Fiesta Melmex Cups and Saucers, designed by Ronald E. Brookes.